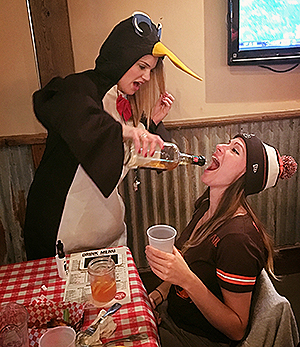 Cleveland fans, we’re the largest and most rowdy Browns Backers club in NYC (and arguably the country) — this will be the first event at our new Cleveland bar. Spread the word: we moved from our old Union Square location (which is now permanently closed to all business). – All tiers include the following unlimited food items: wings, nachos, BBQ sliders, hush puppies and tater tots. All our normal Cleveland specials will be also available during the game: half price wings & rib-tips, $3 Coors Light drafts, $12 Coors Light pitchers, $4 Blue Moon drafts, $16 Blue Moon pitchers. Just head down the steps to the basement level where you’ll enter our Cleveland safe-haven, with over 12 giant TVs and projectors (only playing the Cavs), a full bar and a team of dedicated waitresses. Remember to tell your fellow CLE friends we moved bars and be sure to follow us on Facebook, Instagram and Twitter. And if you haven’t already, please do officially join our chapter. It’s absolutely free and helps us get recognition by the Browns organization and among other chapters around the country.